In the highly competitive world of global business, the corporate landscape is in a dynamic flux. Evolution of new technologies and the ever changing market sentiments demand that organisations change continuously. Business Transformation professionals are at the forefront of advising companies on Change Management. 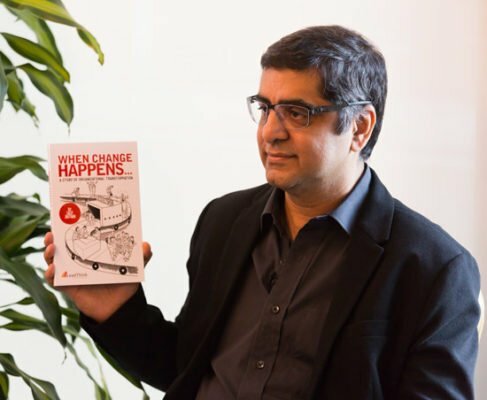 Lalit Jagtiani’s book on change management, titled When Change Happens offers incredible insights into this practice. He has also introduced a completely new style of writing. Following are the excerpts of Team Estrade’s conversation with Lalit. Tell us about your book When Change Happens? The book is a story on Change Management through the eyes of the protagonist who has been selected by his organisation to drive a change management initiative. His evolution from a novice to a master coach is an adventure that is filled with the challenges he and the team of coaches face in building their capability, the acceptance by the Business Unit leaders in entrusting them with the task, the scepticism of the teams that they are assigned for driving the change and the increasingly complex politics that threatens to derail the initiative and credibility of the coaches. The style is immersive and engaging, providing insights and ideas without being prescriptive and raising the awareness of the reader rather than providing ideas. As a practitioner of Business Transformation, I have come across some excellent methods and tools on Change Management. The more notable one has been ‘The Five Disciplines of a Learning Organization’, by Peter Senge . The challenge for me, has been in the application of the methods and tools. Organizations often do not follow the prescribed path of a planned transformation. Every organization that I have engaged with, across Asia and industries, has a unique characteristic and culture. Therefore, I have found that there is no, one prescribed way of ensuring success of interventions. Transformation is as much an art as it is a science. Experience, wisdom and tenacity are components that are often needed to execute these interventions. Unfortunately the practice of Change Management has been a much-abused science. Inexperienced practitioners have peddled a set of communication templates and made the practice into a checklist of activities, the completion of which signifies a successful change program! Often a practitioner encounters challenges and situations that require him to delve deep into his repository of experiences and skills. These are never visible to those benefitting from these capabilities. And, there is very little literature that I have found that provides insights on this tacit knowledge. It is in these lacunae in which I discovered a need; sensed an opportunity. What is Change Management/Business Transformation? Why is it considered as an intervention? The management of Change has moved away over the years from an intervention to a continuous process. For an organisation to remain competitive they need to constantly evaluate the value that they are delivering to their customers this means constantly shifting the way they engage, build and deliver products and services. The employees in an organisation are required to align themselves to be consistent to the value promised and expected of that product or service. When we change that value or delivery mechanism, it will require that the workforce re-align and this is where change management steps in to define, the What, Why, How, When of the new outcome expected. Additionally they need to evaluate and change the organisation structure to deliver the change and ensure that the employees have the capabilities and the desire to execute on the change needed. Given the political, cultural, social and human dynamics this task becomes even more complex. Business Transformation is the overarching orchestrating activity that sits on top of Change Management. In a business transformation, we need to evaluate and align strategy, the value expected to the processes, technology and capability needed by an organisation to deliver the outcome in addition to change management. Why the book in this particular Business-Fiction format and not in the traditional Business format with a clear focus on case studies, etc.? The draw back of case studies are that they are limited by the confidentiality of the inside workings of the organisation and they are prescriptive in terms of learnings. This works if the situation in other organizations are similar but that is rarely the case. The Culture, Political Dynamics, Power Structures etc. are very different. Therefore their relevance is limited. That is why despite the rich amount of literature that is available on change the success rate of Business Transformation is less than 40%. What I have attempted to do in the book is share the real story of how a change management initiative is delivered in an organisation bringing out the challenges in the form of an experiential narrative but kept the organisational context fictional to preserve the confidentiality of the multiple organisations the situations are derived from. This provides the reader with ideas and insights that are either picked up from the narrative or self-generated based on the experiential narrative. I have deliberately kept it Industry agnostic because in my experience the nature of the challenges that I have included in the book are the same no matter the industry. Who is the book’s target reader? The book is intended for students, practitioners of change, managers and leaders driving a transformation and entrepreneurs that are seeking to grow and drive their organisations to achieve new outcomes. You have an incredible amount of experience, advising companies in this particular field, both in India and abroad. What changes have you observed in the way business transformation is accepted by corporations now; in comparison to their level of acceptance say 20 years ago or so? In the earlier days situations were more consistent therefore one had more time to engage and drive change. The organisations had the luxury to drive change with a core of early adopters and leverage their success to create the belief in the change. Today we are in an era of rapid change if we do not get to align our employees and organisations quickly we run the risk of getting disrupted impacting our growth/margin/market share. Organisations need to build a culture of innovation and change readiness across all levels of the hierarchy and these teams would seed and drive the new business models in a time of Volatility, Uncertainty, Complexity and Ambiguity (VUCA). Rewarding early adopters, change capable leaders and allowing for failures are examples of some of the norms that need to be in place. In India the services and advisory businesses are not taken seriously by many traditionally run enterprises. Whereas, the opposite is true for companies abroad. Why do you think this is the case? Something to do with ability to accepting failures and change in general? In India we have a culture of espoused theory v/s theory in practice. Which means that we are good at giving advice but poor at following it and this is the apprehension that most business leaders carry with advisory services. This will change once these services adopt an outcome based fee structure. As individuals, we naturally tend to repeat behaviour that has resulted in past success. Once we lead teams, we tend to follow the same pattern. Therefore, any view that challenges the past successful behaviour is resisted, particularly by the leader, who is also the owner / CEO of the organisation. In the “yes culture” that typically follows these organisations the leaders, do not get enough feedback on the need to change therefore any outside perspective is seen as “theoretical” and stemming from a lack of understanding of the organisation. Is there a particular sector focus for your book? Which sector companies readily accept change management? Which ones require a major push for accepting this? As mentioned earlier the book is “sector agnostic”. Typically sectors that have been impacted by rapid changes like FMCG, Retail, Services etc. are more receptive to change since they have created this capacity in the past. In sectors that have been relatively stable in the past tend to be more sceptical and resistant. What would you advise to Indian Inc., on change management? Especially to start-ups and companies that are at the MSME level. How do you see Government institutions and Government owned companies implementing change management? I have had the experience of driving change in Public Sector companies in India and my view is that change can be successful if in addition to leadership support we have a bottom-up approach where we tap into the ideas of individuals and teams getting them to aspire for the change. I have no experiences with Government institutions therefore I would hesitate to offer inputs. Is the eco system in India ripe for companies to readily accept change, after all bulk of our businesses are still family owned? Families have a very rigid traditional system in India that passes on to the businesses they control. I have a parallel experience of Family owned companies in Asia who have now the younger successors taking over and they are more ready to drive change. This could be due to a number of factors, higher education in the leading universities, the need to take over control and establish their leadership among others. Typically they tend to favour a bottom up change approach where they focus on creating a new and younger leadership with professional experience to lead the new change initiatives. Is there a need to change the way business education is imparted? It focuses on successful case studies and not the unsuccessful ones. We definitely need to learn both from success and failure. However in the Asian context we have been culturally trained to believe that failure is wrong therefore most Asian organisations are reluctant to share their failure stories. And even the failure stories that are shared and softened to the degree that the realities often remain hidden. In the US for example people and organisations are more open to sharing their failure stories. With reference to your experience as a business transformation specialist, what are your expectations from the Government for making India Inc.’s future great? What is the biggest challenge faced currently by companies globally, when it comes to business transformation? The world of business is highly integrated now, than ever before. What is your next book about? When is it coming to the market? This relatively new Genre will provide and encourage many change practitioners with the opportunity to share their experiences. The success of this book will see us produce a series where we collaborate with other authors across the globe to produce stories on Change that will have their unique flavour and real experiences. Using this genre of factual – fiction, it will enable potential authors to be be able to share failures with realistic examples in a fictional context.